BOPIS is an acronym that stands for buy online, pickup in-store. This model is a strategy that many retailers have adopted in order to keep up with consumer demand for convenience. It’s an extension of online shopping that gives the customer freedom to browse online, but also allows them to save on delivery wait times. The retail industry has to constantly adjust to trends and buying habits to survive in the competitive market, and one of the most effective ways to do so is investing in omnichannel fulfillment. The buy online, pickup in-store model is a perfect example of this. By catering the shopping experience to customer needs, retailers encourage more purchases, leading to growth opportunities for the business. Why should you pay attention to BOPIS? It’s more than just a trend. A 2018 survey found that 67% of respondents used this feature in the past 6 months. It’s changing the expectations of customer experience, and big box retailers like Ikea and Home Depot are leading the way. In this blog post, we dive in to the benefits of the BOPIS model for both consumers and retailers. We also explore the new challenges that arise for inventory management, and steps you can take to navigate around them successfully. Instead of spending time searching for the item in-store, customers can place their order online ahead of time. When the order goes through, the staff will pick the item from the shelf or inventory and prepare it for the stated pickup time. The customer gets their purchase in store, and they save time by not having to wait in the checkout line. They also go to the store knowing that their item is there. Rather than having to visit multiple locations to find the right size or color in stock, securing the details online eliminates the hassle. Sometimes, customers can buy online and pickup in-store on the same day. Where online shopping can take a few days or more for delivery, the BOPIS strategy gets the product in the hands of customers faster. Inventory would be stored at an accessible retail center, not in an isolated warehouse. Customers would just need to choose their preferred location. Through the BOPIS model, customers experience the benefits of both online shopping and traditional retail service. They can take their time browsing online and compare different features and prices, and they don’t feel pressured to buy. They would feel more satisfied in their purchase knowing that they did their research. When they come into the store for pickup, they can get their questions answered by real sales associated if needed. BORIS is the acronym that stands for buy online, return in store. It’s another service that caters to consumer convenience. A survey found that 33% of people decided to return their online purchases in store to avoid the return delivery hassle, and 18% did it to receive faster refunds or exchanges. When retailers have dedicated staff to take care of BOPIS and BORIS orders, the customer service experience can be seamless. Customers are encouraged to buy more if the ease of purchasing and returning is guaranteed. When customers come into the store to pick up their orders, they often make additional purchases. In fact, 75% of people who used BOPIS bought something else while they were in store. Curiously, it is shoppers between the ages of 35-49 who use BOPIS the most – not millenials. This is likely the demographic that would benefit most from the convenience it offers. With full-time jobs and families, placing an order online and picking it up can be an easier option in their busy lives. When consumers are driven into physical stores, this leads to more in-store transactions and provides opportunities to upsell, cross-sell, and retarget. When products are stocked in the back rooms of retail centers, order processing and delivery to customers can be done in the same place. This lowers the logistics costs associated with storage at a separate warehouse facility. It also reduces the costs from losing an order during delivery to the customer’s home. Since the inventory is in a central location, the order fulfillment process is faster. The item doesn’t need to be packed for parcel delivery to the consumer either. There are shorter lead times for the customer and their overall experience is enhanced. There is also opportunity for higher inventory turnover since products get into the customer’s hands quicker. By merging your e-Commerce and retail channels, you have the ability to connect online and offline customer data. You have a unique perspective of the customer journey, so you can combine this data with predictive analysis to drive marketing strategies. In light of this, the BOPIS model is not without its pitfalls. When it comes to omnichannel fulfillment, there are many considerations to take to ensure the same level of customer service and security. Many retailers don’t have dedicated staff to manage BOPIS and BORIS orders. This omnichannel strategy requires careful planning, otherwise poor implementation could cause more harm than good. For example, some customers find that it takes staff a long time to retrieve their orders. They arrive at the store at the stated pickup time, only to find that their order is not yet ready for them. Serialize your inventory and take advantage of barcode or RFID scanning. You can keep track of stock, reduce errors, and increase efficiency in your overall fulfillment process. Train your staff and provide them with the tools to do their job effectively. Accurate and efficient asset management is key with the BOPIS model. Serialization can be used beyond the sale of the product as well. By tracking with serial numbers, an inventory management system can make the process of quality control, recalls, and warranties much simpler. Like their names suggest, stock-outs occur when an item is out of stock, and overstocks occur when there is more inventory than required. 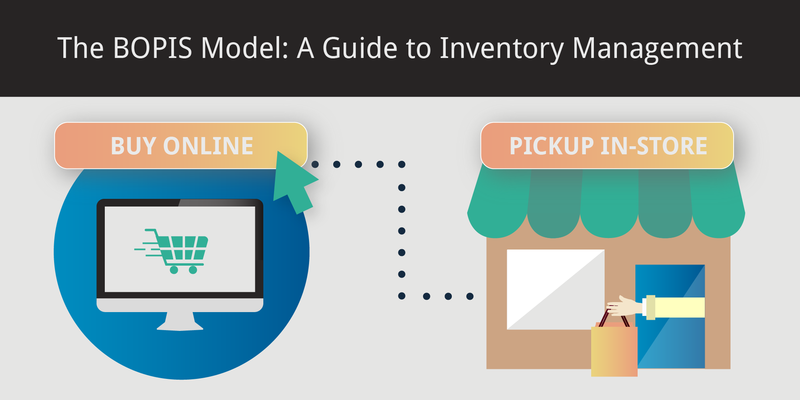 With the BOPIS feature, retailers have a unique challenge to overcome because their inventory levels must sustain a higher volume of customers. Businesses need to ensure their inventory levels are balanced across all locations. For BOPIS to work, customers expect items to be in-stock near them. Having a reliable inventory management system is a must when when offering BOPIS services. Businesses must ensure they have enough quantities on hand for both online and walk-in customers. One of the most important features in your inventory management system would be setting up reorder points so that low level stock can be replenished when it reaches the minimum quantity you set. Remember to account for safety stock in your minimum quantity on-hand calculation. Not only would this help reduce stock-outs, but automating replenishment could save your staff a lot of tedious manual work. Many stores only require a driver’s license or confirmation number to pick up the order in store. The challenge is that BOPIS orders do not require a delivery address so confirming identity can be tricky without compromising the customer experience. It can also be a nightmare for retailers when fraudsters cancel their order last minute, but arrive in store to pick it up before the inventory system can sync the payment cancellation. Since the transaction is done online, but the items are picked up offline, businesses need to ensure both fulfillment systems are integrated and updated in real-time. Machine Learning can boost fraud protection as well. Robust systems can analyze whether or not a transaction is fraudulent or not with data mining. Another strategy to reduce risk of fraud is to prioritize BOPIS orders so they can be manually reviewed. Especially if there is same day order pick up offered, having dedicated staff to manage BOPIS orders would be wise. Implement an inventory management system with advanced features to help you manage high volume orders and inventory. Set up clear signs. Customers shouldn’t have to wander around to find the pick up counter. Send an email confirmation immediately after order placement. Include pick up time, location, and the identification required. Optimize your website and keep the customer in mind. Suggest alternatives for out of stock products. Even if the item isn’t available at the customer’s preferred pick up store, the store should still be listed in the store locator with a description saying when it could be available. The BOPIS model has benefits for both the consumer and retailer. And while there may be new challenges that arise, there is no denying its staying power. More and more companies are adopting omnichannel fulfillment. Soon, it will be a standard for the retail industry if they want to stay competitive with the convenience their e-commerce competitors offer. With the BOPIS strategy, a higher volume of inventory comes into the store to meet the demand of online orders. It’s even more important to have an advanced and reliable inventory management system. Features like automatic replenishment, barcode scanning, lot control and shelf life tracking should be basic capabilities of your system. Having real-time visibility is important for both your customers and staff. Taking it a step further, your system should be able to generate in-depth reports and provide insights to inform your business decisions. The BOPIS model merges e-commerce with traditional retailing, and a fully integrated inventory management system can help you streamline your operations.